The first black female conveyancer to be admitted in South Africa, attorney Selemang Mokose was born in the United Kingdom and is in the process of obtaining her South African citizenship — which does not preclude her from appointment to the judiciary. In preparing for her judicial aspirations Mokose has completed a judicial skills training course, and basic and advanced aspirant judges courses — the latter two hosted by the South African Judicial Education Institute. She has acted in the Gauteng Division of the High Court in 2016, 2017 and 2018 and during that time, has heard matters ranging from criminal law to civil procedure cases. In 2017, QBX Consulting Services approached the high court claiming to be a creditor of Mafuri Turnkey Accelerated Construction and, in terms of the Companies Act, sought an order placing the latter under supervision and the initiation of business rescue proceedings. QBX alternatively sought an order placing the company into liquidation. Mafuri, however, questioned QBX’s locus standi (whether it was in fact a creditor and had a right to bring the application) and Mokose found that the applicant was not an affected person. Mokose then considered two conflicting judgments in order to determine whether the respondent was in financial distress or not. Noting that there was no finalised case in either her division or at the Supreme Court of Appeal, Mokose used a precedent set out in a decision from the Western Cape Division of the High Court. The judgment found that an applicant in such matters must “give concrete and objectively ascertainable details going beyond mere speculation. The applicant has failed to give such details in his application and for that reason, I order that the prayer that the respondent be placed under supervision and business rescue fails,” Mokose ruled. She further found that on the applicant’s own version Mafuri was commercially solvent and able to pay its debts and that insufficient evidence had been presented before the court to prove the contrary. “The alleged debt which has caused the applicant to bring this application first needs to be proven at trial for the applicant to qualify to bring this application at all,” Mokose noted, dismissing the application with costs. In Bonase v S, an appeal of a magistrate’s court decision heard together with Judge Colleen Collis (who concurred), the issue related to an incomplete record of the trial proceedings. The charge sheet and audio cassettes on which the trial proceedings had been recorded were missing. In an affidavit the magistrate who had initially heard the case, confirmed he no longer had his trial notes nor an independent recollection of its facts. Compounding matters the prosecutor in the original hearing had died while the appellant’s then attorney was no longer practising and could not be traced. Mokose noted that the record was “of cardinal importance” since it formed the basis of the hearing of an appeal and an inadequate or unavailable record “could lead to the conviction and sentence being set aside”. “Although the appellant and/or his legal representatives carry the ultimate responsibility to ensure that the record is in order, the courts have commented that the responsibility not only lies with them but also with the presiding officer, clerk of the court and the operators of recording machines. The absence of such a record hampers a just hearing of the appeal or review thereby constituting a ‘technical irregularity or defect in the procedure’ … and renders the conviction and/or sentence liable to be set aside,” Mokose found. The conviction and sentence was set aside. Mokose was unsuccessfully interviewed for a position at the Gauteng Division of the High Court in October 2017. During her 15 minute interview, she lost points for the length of her reserved judgments and her failure to furnish an auditor’s certificate for her practise in 2004, 2005 and 2006. The certificate was subsequently furnished but she was fined R10 000, suspended for five years, by the Law Society. Mokose’s academic achievements include a BA (Law) at the National University of Lesotho (1984) and an LLB from the University of Witwatersrand in 1987. She has a certificate in refugee law from the University of Cape Town and was part of the institution’s property development programme in 2013. During her interview attorney Selemeng Mokose’s responses to questions posed to her were deliberate and measured. A somnambulist pace which accentuated the sleepy start to Tuesday morning’s interviews by the Judicial Service Commission (JSC). 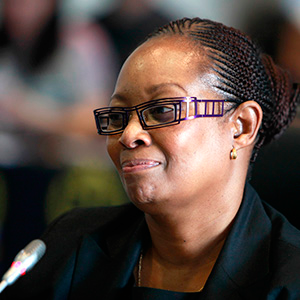 Although Mokose’s British citizenship is not a hindrance for her appointment to the high court bench — only Constitutional Court appointments are required to be South African citizens — much of her forty minute interview centered on her “relationship with Britain” as Chief Justice Mogoeng Mogoeng described it. Justice Minister Michael Masutha went so far as to intimate that Mokose had only thought of applying for South African citizenship in pursuit of her judicial aspirations. Mokose denied this and told the commission that she had held on to her British passport largely for ease of “travel”. A more pressing issue that the JSC did canvas with Mokose was whether she had enough experience of court room procedure and its cut-and-thrust. Commissioner Msomi, one of four lawyers appointed to the JSC by the president, pointed out comments submitted to the commission by legal bodies which had raised this criticism and that she had not been “adequately prepared” for matters to be heard. Mokose admitted that she had “not personally appeared in the high court” but had “worked more as a consultant in relation to litigation”. Mokose also cited three judicial courses she had attended to prepare herself for the bench. She also noted that at an earlier stage in her career she had been prohibited from obtaining a right of appearance in the high court because she had not completed a required tertiary-level Afrikaans language course. Mokose also told the commission that she was not intimidated by the volume and intensity of work at the Gauteng Division of the High Court. She said it was very difficult to respond to the allegations of being under-prepared for court without knowing which matters specifically, the criticisms referred to. Asked by Dali Mpofu SC, representing the advocates’ profession, what she had done for transformation of the legal profession, Mokose said she had prioritised developing black females both as a director at law firm Bowman Gilfillan and when she ran her own practice for 12 years. Attorney Selemeng Mokose’s interview did not go well. She lost points for the length of time several of her judgments had been reserved and her failure to furnish an auditor’s certificate for her attorneys practise almost a decade ago. The certificate was subsequently furnished, but she was fined R10 000, suspended for five years, by the Law Society of South Africa. During an interview which lasted around 15 minutes, Mokose told the Judicial Service Commission that while she had not experienced racism on the Bench, she did while practising as an attorney.